Today I'll be reviewing the Joovy Scooter X2 Double Wide Stroller. This is one of the most popular double wide stroller on the market, and for many good reasons. This stroller is not only attractive and versatile, but it is a favorite among many parents. One of the biggest features that sets this double wide stroller apart is the width. Many double strollers are extremely bulky and wide. The Joovy Scooter X2 is only 30 inches wide! This means that you can easily keep on moving right through those narrow doors. Check out my review below to see if the Joovy Scooter X2 Double Stroller might be for you and your little ones. The Joovy Scooter X2 Double Stroller has big wheels. The four larger 7 inch front wheels and two 9.5 inch back wheels make it easy to maneuver almost anywhere. The lightweight and narrow design make getting around very easy. The two front wheels and two back wheels make this stroller extra stable, which is great if you have kids who constantly climb in and out. The width of the Joovy Scooter X2 is only 30 inches. Measure around your house doors and I think you'll realize just how narrow this stroller is. Both seats are fully adjustable on their own. This makes it nice if you have an infant and a toddler. That means you can recline your infant back to nap, while your toddler sits upright and enjoys the ride. Both seats have a five-point adjustable harness system, and a 45 pound load capacity. The canopy on the Joovy Scooter X2 is huge compared to all the other double strollers on the market. It is a great feature. For the bigger child, he or she will be covered from the sun or rain with this mega canopy. The Joovy Scooter X2 Double Stroller has lots of storage. Both underneath the seats and behind the backs of the seats are big storage units. Also included are zip pockets which are great for storing your cell phone, money, or vehicle keys. Two cup holders for adults are also included. The company added a removable bumper bar. If you have children that like to try to climb out, this is a nice feature. It also makes a nice place for a child to hold onto, especially when the going gets bumpy. If you choose the Joovy Scooter X2, you will have your choice of blue, red, or black. Some strollers just come in one color, maybe two colors, so this is a plus if you like choosing your own colors. The Joovy Scooter X2 has a foot brake for when you want your wheels locked. This is a great feature for when it's time to stop and not move on. It helps protect kids who climb in and out on their own, and also helps your stroller to not roll away. Unfortunately, there is no hand brake on this stroller. For that reason, I would not recommend this stroller for running. When running and especially when going down hills at a fast past, a handbrake is going to be essential. This is not the case if you are using your stroller for every day walking and errand running. The Joovy Scooter X2 does not include a car seat adapter. It simply isn't designed to be used with a car seat. For some people, this is no problem, but for others this may be a disadvantage if you were wanting to put an infant car seat in one of the seats. Both seats have a clear canopy top section so that parents can see their little passengers. This is so nice because it means you don't have to keep stopping to check on your children. Simply look down through the window and you can see all that is going on. When my daughter was younger, she liked looking back up at me and smiling through the peek a boo window. I am sure you will enjoy having similar experiences with your kids. 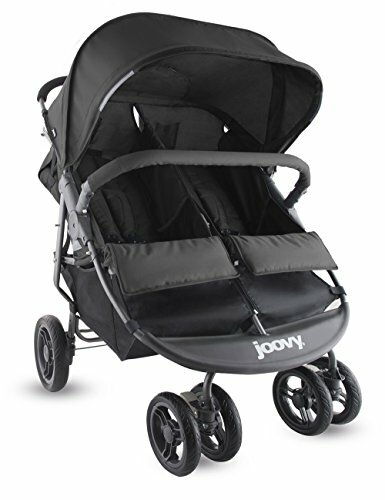 Joovy sells a rain cover to go along with their stroller. However, it is not included in the price listed above. I love having a rain cover on my stroller and use it often. There are so many times that I wouldn't have taken my daughter out had it not been for having a rain cover. But, we can go out in the rain because I know that wherever we go she'll be toasty and warm. If you are an outdoorsy person and rain doesn't scare you away, definitely think about getting the rain cover. Joovy prides itself on answering on around the second ring of any customer service call. They don't have an automated telephone service that makes you wait in line. In all of the reviews that I read, customers applauded the customer service efforts of Joovy. This company truly wants to make things right if you are not 100% satisfied. If you are wanting a double stroller that fits through a normal sized doorway, than the Joovy Scooter X2 might just be for you. This stroller is not bulky and also collapses down to a good size that makes it one of the easiest double strollers to put in your trunk or back seat. The Joovy Scooter X2 Double Stroller is a side by side stroller, but it has the advantage of a tandem stroller in that it can fit between a normal sized door. This makes a world of difference when you are on a subway or trying to maneuver around tight places. I highly recommend the Joovy Scooter X2 for people wanting a double stroller that is easy to maneuver though tight places. Who doesn't, right? Joovy developed a design that didn't compromise comfort and roominess when making a compact stroller. The ease at which it folds up is also a big plus. For a parent with two small passengers on board, the last thing you need is to be struggling to fold up a bulky stroller while simultaneously trying to watch your kids. I don't recommend this stroller for jogging, because there is no hand brake system in place. For traveling at higher speeds, a hand brake is going to be an essential and a much needed safety feature. However, it will make a nice stroller for walking and running errands throughout the day. To see our full review of the top ten double strollers of 2018, click here.